Vermont is counted among the state that has a higher standard of living. The number of certified nursing assistants employed in Vermont according to the Bureau of Labor Statistics (in May 2013) was 3,050. These employees received mean annual and hourly income of $27,060 and $13.01 respectively. Employment per 1000 jobs for CNAs in VT was estimated to be around 10.21. Indeed.com revealed that the nursing aide salary, in January 2015, was $22,000 per annum, which was 12 percent lower as compared to the average CNA earnings for job postings at the national level. Depending upon the job experience, employer, and the geographical location, a certified nursing assistant could earn more or less than the provided salary figures, as their annual earnings. 90% of CNAs made less than $35,280; 10% made more than $35,280. 75% of certified nurse assistants were waged less than $29,900; remaining 25% were offered more than $29,900. 50% of the employees earned less than $26,570; the rest of 50% earned more than $26,570. Income of 25% of CNAs was less than $23,020 while the income of 75% was more than $23,020. 10% of employees were paid less than $20,420; 90% were paid more than $20,420. 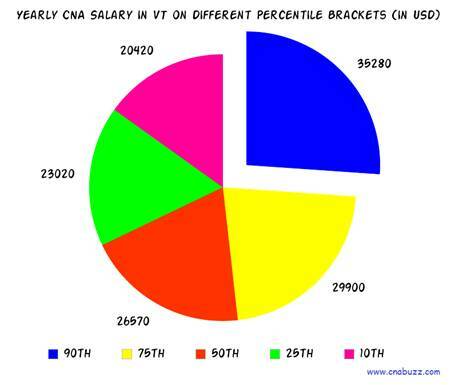 Generally, the earnings of CNA vary as per the geographical location. However, in Vermont, the salary of certified nursing assistants is almost same in all the cities. As stated by salary.com, in January 2015, Rutland offered $29,791 to CNAs whereas remaining cities including Burlington, Colchester, Essex, and South Burlington paid $28,630. The median hourly salary was same in all the cities, i.e. $14. The position, you hold in this profession, decides the level of authority being assigned to you, your responsibilities, and most significantly your earnings. CNA Hospice (highest paid job title) managed to earn $28,000 in January 2015. Medical Assistant Family Practice and CNA Rrmc made $26,000. The lowest paid employees were Correctional Prison Facility CNA, who received $13,000 as per indeed.com. With the increasing aging population, the job outlook for certified nursing assistants is quite good and predicted to increase by 21% in the years 2012 – 2022, according to the Bureau of Labor Statistics. This growth is much higher than other professions. The demand for CNAs is huge as these workers are an important aspect of the healthcare industry. The only hindrance, which can occur in this growth rate, is the dependence of nursing homes on government funding. Otherwise, there will be enormous jobs for nursing aides in the upcoming years. Question 1 – I’m living in South Burlington, but planning to move to Colchester. Is there any difference in the annual salary within these cities? Answer – No. Both the cities provide the same annual salary i.e. $28,630. 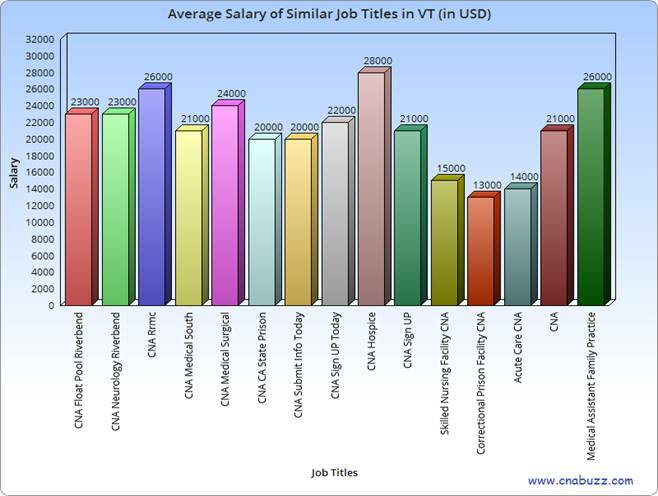 Question 2 – In Vermont, what are the highest paying job titles? Answer – In the state of Vermont, the job title, which offers the highest salary, is CNA Hospice with annual income of $28,000. Other job titles include CNA Rrmc ($26,000), Medical Assistant Family Practice ($26,000), CNA Medical Surgical ($24,000), CNA Neurology Riverbend ($23,000), and CNA Float Pool Riverbend ($23,000).